Fishing and Kayaking are two sports that go together hand in hand. There is nothing better than sitting in a beautiful lake gently bobbing with the ebb and flow of the water while you keep a keen eye on your float, waiting for it to wiggle and dip under the water. I personally love all water-sports and have only recently become a huge fan of kayaking. Combining this new found hobby with my passion for fishing was the natural progression, and allowed me to get to more remote fishing spots where I can really get stuck into the fish. 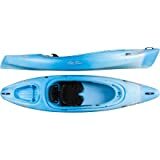 Once I began researching my first purchase (naturally I wanted to buy the best fishing kayak), I realized that there were a huge array of different crafts available, and not really anywhere that pooled all the information together. Being a little bit of a geek, I decided to build this website to help any of you who were looking to find the perfect floating fishing base to get off the bank and into the beautiful lakes, rivers and coastline that our amazing country has to offer. No matter who you are, your needs are going to be different from the next persons, so one thing I found super helpful when I was trying to decide which kayak to buy was to consolidate all the information into one giant table. Next I used filtering and sorting functions in Excel to help me rearrange the data so I could see the real best kayaks. The pick of the bunch so to speak. To summarize the whole process, I’ve copied the top kayaks from my personal research document into this website. You can click here to jump to it (or just keep scrolling down the page a little further). To make things super useful for you, you can not only sort any of the columns, you can also filter the table by entering your own criteria in the search box. 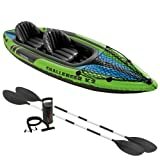 Often Amazon will have really good discounts on kayaks, so sometimes the price will be lower than it was when I checked out the product. Unlike the olden days where the price was relatively stable, with competitive markets like fishing and kayaking, there are good discounts to be had. You just have to click through the links to view the products on Amazon to get the best available price today. To find the perfect kayak for your needs, you will also need to consider your experience. A kayak that comes with a complete package including oars, rod holders etc might be good for the beginner, but the extra packaged kit may be surplus to requirements if you are already an experienced kayaker who is looking to upgrade their gear. You will find this type of information in the following quick snippet reviews that we have posted below. They should be enough of a taster to see whether a particular model fits your needs or not. Much more detailed reviews are found in the reviews section of this site. Taking our gold medal is the excellent Old Town Vapor Angler Kayak. It’s 10 feet long and is built out of a very tough polyethylene hull. With the Angler version, you get the cover for the useful cubby hole, and if you’re planning to use this kayak for extended periods of time then you’re in luck as this comes with one of the best padded seats on the market. We found this particularly comfortable to sit in with the adjustable foot rests and thigh pads gave us excellent control and power transfer when paddling. Fitted with front and rear carry handles the version you’ll want to buy if you are a fisherman is the Angler, which is also equipped with two flush mounted rod holders (behind the seat), an anchor (with trolley system) as well as deck bungee cords. For the money, you’ll be hard pressed to get such a complete and polished fishing kayak. The average rating by Amazon customers is 4.7 out of 5 from over forty satisfied customers. An excellent score, confirming this is the fishing kayak to buy. If you like to take your partner fishing, then this is the best tandem fishing yaks available on the market today. The 10 foot Sport Fisher Kayak is ready for single or tandem use this tunnel hull designed kayak is well balanced and sturdy. In fact one of the things we liked most about this kayak was the fact you could stand up and fish from it without it rolling. You can also ride it sideways without any fear of it tipping. This means no matter what your preference for fishing position, you can rely on this kayak to be a solid base to cast from. The Sport Fisher Kayak model we had included fishing pole holders, a useful rear storage hatch and shock-cord straps to secure loose items. As expected carry handles and scupper holes were featured. If you are a small family or a couple who like to head out on the water together, then this is the kayak that you should be considering. On Amazon this model scores an impressive 4.4 out of 5 from fifty happy owners. And finally in third place, comes the very competent sit in, Sun Dolphin Excursion kayak. The fishing version is complete with 2 flush mounted rod holders and a single swivel holder. This Excursion kayak by KL industries is designed with maneuverability in mind, and tracks very nicely on the water. 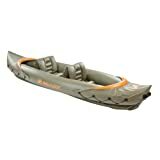 Like the other two kayaks this one also has a sturdy, polyethylene hull, with a convenient storage hatch with shock absorbing deck rigging for loose items. The sit-in kayak has adjustable, interior foot braces and an adjustable seat with high back support for comfort. Whether it is as comfortable as the Old Town version is slightly debatable but we really liked the high back support – for those long fishing trips when nothing is biting. 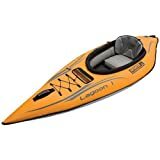 On Amazon this slightly cheaper kayak suitable for fishing – comes out with an impressive 4.3 out of 5 from well over twenty customers. You may have noticed that there are also inflatable hull kayaks available. 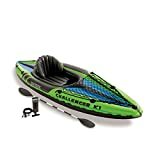 We have reviewed a few of them in the review section of the site and personally I’ve found (contrary to my initial judgement) that inflatable kayaks are also very solid and perfect for a weekend of fishing. Depending on how strapped you are for space, and whether you live near a lake or the ocean, it may sway your choice one way or the other. In general, for quieter kayaking inland (slower rivers, and lakes) the inflatable kayaks prove an excellent choice. The benefit is because they are so lightweight and fold up into such a small size, you can leave them in the trunk of your car at all time, without necessarily having to think about preparing for a fishing trip. This flexibility is something I personally enjoy. I have an Intex Explorer K2 packed down and waiting in the trunk should I happen to drive past an amazing lake on the weekend and need to have a quiet hour on the water getting away from it all. The fixed hull kayaks are much better in the sea and in faster moving water. They are more stable and solid as well as being more maneuverable and tracks on the water very confidently, which is a huge benefit compared to the more drift prone inflatables. What you gain in one area you lose in another, as these boats are larger and require a roof rack or some kind of trailer to take them to your fishing spot of choice. If in doubt (don’t let my wife hear me say this) then you can always buy one of each. It has to be said that kayak fishing is amazing fun, but one downsides is due to the fact that you are fishing very close to the water from a small platform. It’s easy to drop your gear overboard and naturally you can expect pretty much everything in the boat to get wet at some point. Here is a video detailing how to keep your gear protected to ensure you aren’t replacing gear every time you want to go out fishing. Throughout this section we’ll be taking you through the Inflatable Sit On Top Kayak genre. With a whole page dedicated to inflatable kayaks, the Sit On Top models were a little over looked. This was because we wanted to talk about them in a little more detail, and perhaps also to the niche audience of kayak anglers rather than the first time kayaker. As an angler, I’m sure that we don’t have to explain the prolific rise in kayak fishing we’ve seen in recent years. 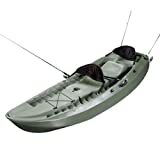 However, for those that are looking to get started with kayak fishing, but perhaps can’t afford the outlay of a hard based dedicated fishing kayak, inflatable sit on tops may be the way forward for you. If you’ve taken the time to explore the site, you’ll have found an abundance of information on the benefits of inflatable kayaks. Just to reiterate, they are lightweight, portable, easy to handle and most importantly, they are vastly cheaper than their hard bottom counterparts. Where the majority of inflatables are geared towards first time users and families, more recently there has been a push to address the gap in the market that is kayak fishing. Well, inflatable sit on tops fill this gap, no questions asked. For a fisher, you’ll be looking for a few enhanced characteristics. You’re going to need extra buoyancy due to the level of gear you’ll have on board. Furthermore, you’re going to need storage space for that gear, a comfortable seat for the longer outings, and also enough stability for you to be able to stand up and spot your targets. Now that is a lot of boxes to tick, and not all kayaks will be able to tick them all. One kayak that has real potential to become the sit on top inflatable, is the Sevylor Inflatable Sit on Top Kayak. Sevylor are a well respected kayak manufacturer, so you know that you have a certain amount of quality guaranteed with your purchase. 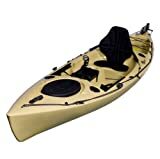 This particular model is a great entry level kayak, priced at just $160. Although entry level, it has everything that you need for your first fishing based kayak, as well as a little more. The level of storage offered is great, with a front compartment for bait, line and tackle with enough space left over for a packed lunch as well. There are also drinks holders either side of the cockpit that can be used a little imaginatively, they could hold one of your rods as well as a pot of bait if needed, although I would recommend getting a designated rod holder attachment. As well as the storage, this kayak is really buoyant, and with buoyancy comes stability. There’s enough space for you to stand up and spot fish as well as to sit unencumbered for a long period of time. The only thing that really holds it back, is that it can’t deal with any kind of current. Your fishing outings will therefore be limited to lakes, rather than faster moving rivers and the open ocean. However, as a first time fisher, it does the job and then some. Where it lacks the space to become a more advanced users designated fishing vessel, it does more than enough to entice and beginner and kick start your angling career. This is one that definitely comes with the Drakkar Kayak’s coveted seal of approval.